Easier to Track Your Order. Hear the VOICES from our customers.You can TRUST us as they did. Willow Parrish Loves COCO REMY HAIR. 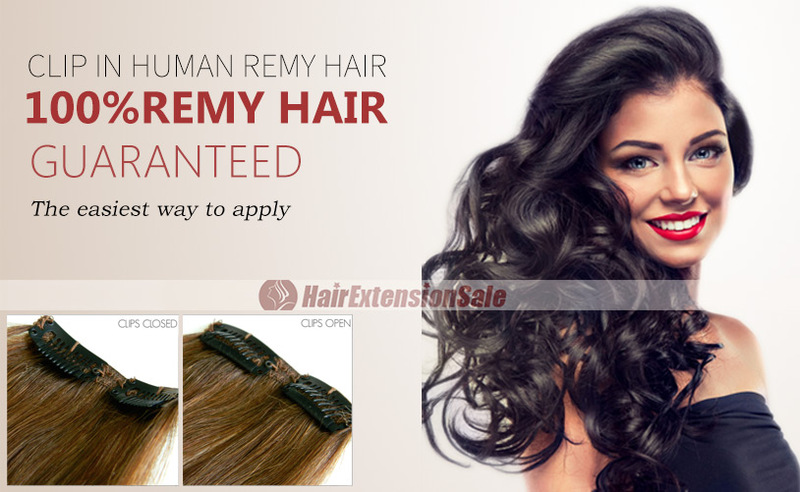 Human Clip In Hair Extensions. 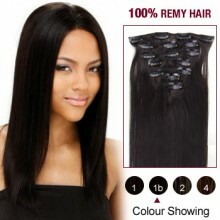 Indian Remy Human Clip In Hair Extensions. Dip Dye Ombre Hair Extensions " Rainbow Inspired"
Have you tried this product? Help out by sharing what worked (or didn't)! I usually pay so much attention to the reviews that I almost didnt order these, fortunately I was smart enough to ignore the bad reviews. These extensions are great. Definitely not a waste of time or money. A+++++ excellent seller. Super fast ship!!! I really like being able to have my hair a different color without having to damage it in the process. Love these two tone extensions! They blend with my hair so perfectly that no one can tell they they aren't my own! I highly recommend these to people with this hair, like my own.Well worth the money! I loved them when I first got them, but I feel the bottom ends have become a little bit rough, they almost feel synthetic- not like real hair, I am a little bit sad. Easy! 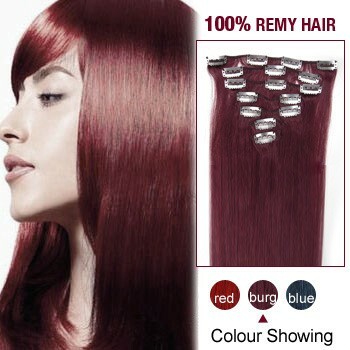 These extensions are amazing,Great product and fun colors!!! These are great. They stay in wonderfully! Fun, easy product to use. I would recommend them. I received the hair extensions last week and i absolutely LOVE them.The hair was great quality and the shade was perfect, they looked very real. Thanks for all of your help! I would just like to say thank you very much for getting my hair extensions to me so quickly, the hair is a perfect match and the quality is brilliant!! Thanks a lot!!! I ordered this two weeks ago. It came to me within13 days! This is the second product I\'ve purchased from your site! Both have been perfect quality and look amazing! 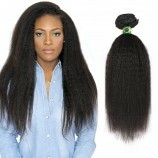 Available lengths: 10" 12" 14" 16" 18" 20" 22" 24" 26"
Our hair length depends on the different hair textures you choose. 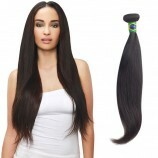 The straight hair naturally falls longer because it lies completely flat when it's measured. We measure the length of our curly hair when it is in a straight position because it has more volume for the same weight. The length of our wavy hair texture lies in-between that of the straight and curly as you can see in the above picture.This guide will help you to determine where a length will fall when placed at the top of the head. The hair will fall even longer when placed at the nape area. Our color ranges in all the popular hair colors listed below, which are all in stock and ready to ship in time. These colors list can accommodate 90% of our consumers. If you are still not sure about your hair color, you can order a color ring to see the entire range of colors we have for sure. We can also offer color customizing on all our products if you have special needs. You'll work from the bottom up, so start by sectioning off your hair and securing most of it at the top of your head. if your hair is freshly washed, be sure to add some grit to your roots by using a dry shampoo before adding hairspray to the roots. This will give the clips more hold so they won't slide out. Section the hair off in small pieces and use a backcomb to tease the roots where the clips will be.The hair pieces have either two or three clips (very small pieces for filler have only one). Start with a clip that has three combs on it, making sure to open all the combs. Attach the clip where you've backcombed by sliding it into the teased area from the top and snapping the clips shut. Make sure to getthe edge of the hair piece as close to your scalp as possible.Once you've attached a piece, let down an inch width of hair to attach more piecesto.Spray the roots of that section with hairspray as well for more hold. Once again, backcomb the hair at the roots, paying extra attention not to disturb the piece that has already been clipped in. Secure the nexthair piece as before. Place the side pieces above the ear making sure to keep the clips back far enough so that they won't be visible once you've let your hair down (a good guideline is to not place them in front of you ear). It's okay if the pieces overlap with each other, just be sure to clip onto your hair, not the extensions. Once you've added all the pieces, take the remaining hair on top of your crown and section it off to be backcombed. This will add more texture to the hair and hide the pieces better. Backcomb from the middle of the top of your head back, into the extensions. Once you've backcombed the top section of your hair, spray with hairspray to ensure it stays all day and keeps the extensions camouflaged. Since the extensions are made of human hair, you can use any product or heat tool on them so that they blend in with your natural hair. Be gentle. One of the most important things about hair extensions is that you have to baby them. When you are brushing your hair, be gentle. 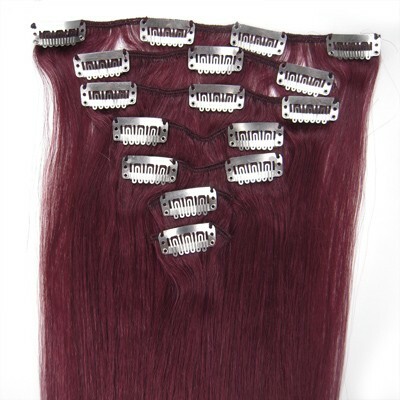 Without the proper treatment, your hair extensions will get damaged quickly. Wash with moisturizing hair care products. This step is especially important if you are using clip in hair extensions because the hair will not get any of the moisture from the natural oils your scalp produces. Moisturizing hair care products will keep your hair healthy. If you are longing for shine, use a serum. Many hair care products that promote shine have a drying affect on hair. Keep those ends trimmed. No matter what you do, your hair extensions will inevitably get split ends. The best way to keep split ends from getting out of control is to regularly trim them. Trim the ends of the hair every 6 to 10 weeks. Keep in mind that you don’t want to trim too much, otherwise you will quickly lose the length of your hair. You can either do it yourself or have a professional trim them. Use a heat protectant. Nowadays, just about everyone uses heated appliances on their hair. Whether it’s a blow dryer, curling iron or flat iron, they all have one thing in common: they damage your hair. If you want to make your extensions last, your best bet is to use a heat protectant whenever you use a heated appliance on your hair. This simple step will prevent breakage and keep your locks looking great a lot longer. 1.Pay via Credit Card / Visa, Mastercard, AMEX, JCB ect. Note: Please choose one payment methods at your convenience. Remember to try another if you can not go through one. Don't Worry! we only charge you once. the order will be cancelled automatically if your payment didn't go through. 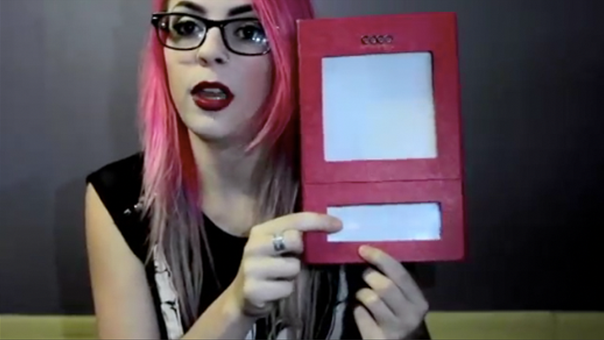 The postage for standard shipping is $6.95. If your order is over $59, you get Free shipping. Q: What are differences between human hair & synthetic hair? A: Human Hair offers the most natural look and feel. 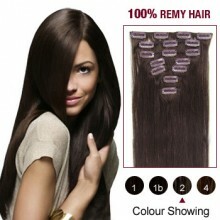 It is remarkably soft with a shine and movement that is not easily duplicated in synthetic hair. It is also extremely versatile. Human Hair can be cut and styled to suit your personal tastes. And while it can be a more expensive pick, with the proper care, it is also more durable and can last over a year. With technological advances, synthetic hair has come a long way in recent years. In some cases it is difficult to tell the difference -- the denier and texture are such that they feel almost like human hair. As a matter of fact, with some of the higher quality synthetic pieces, you would never know they were not natural human hair if you didn’t have the human hair right next to it to compare! Q:What are differences between human hair & synthetic hair? A: Unfortunately, any heat styling runs the risk of damaging synthetic wigs. Wigs with synthetic hair can be purchased pre-curled or in any style you desire. Alternatively, you could curl the wig with a styling method that does not involve heat. Wigs with human hair will not be damaged by heat styling. Q: What type of fiber is used for your synthetic wigs/hairpieces? A:The fiber is made from the raw material Kanekalon, which is imported from Japan. 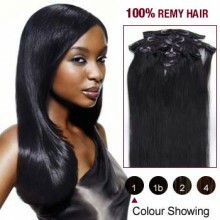 It's commonly used for hair extensions, weaves, wigs and doll hair. Kanekalon is flame-retardant and comes in a variety of styles and textures, plus more than 120 colors. Q: Can I color or straighten the hair in this wig? A: Wigs made with human hair can be colored or styled as you would your own hair. Synthetic wigs can be colored, but heat styling of any kind could be damaging to the fibers. Get updates, discounts, special offers & big prizes! Check your inbox now to get the code.